The Academy Awards were last night. And, instead of watching them, my husband and I watched old episodes of Star Trek: The Next Generation (because we are nerds). But, from what I’ve heard, the show was full of excitement. 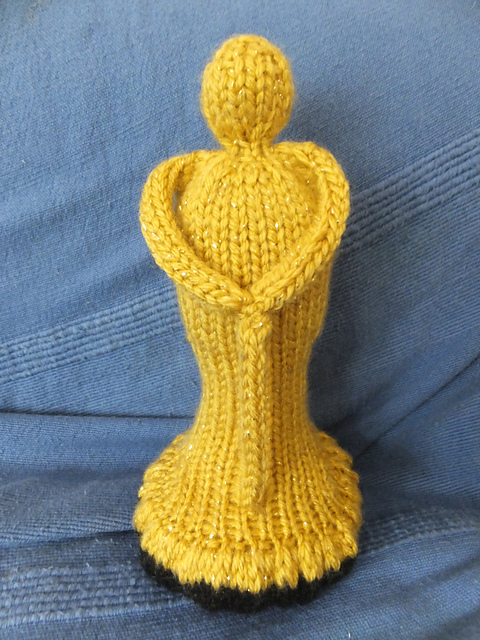 So, here follows my zero-research (except for what my friends texted me while they were watching) report on “What Happened at the Oscars,” as explained by fiber arts projects. The Oscars happened last night. Lots of people got awards for being in movies. When they won, they got to take home a little trophy. Academy Award/Oscar Statuette by Susan J. S. Walkup 2. Apparently some Batman/Joker movie won an Oscar. People seemed pretty upset about that for some reason. 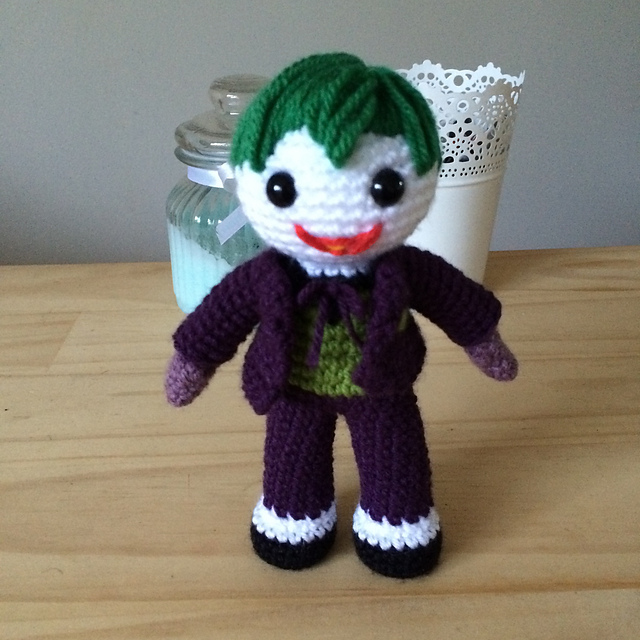 Joker Amigurumi by Clare Heesh 3. All the ladies attending the award show wore gowns. (This one I actually did do some research on, because I like looking at pretty dresses.) They were all very fancy, and almost no one wore anything with color. So much beige, white, and black. 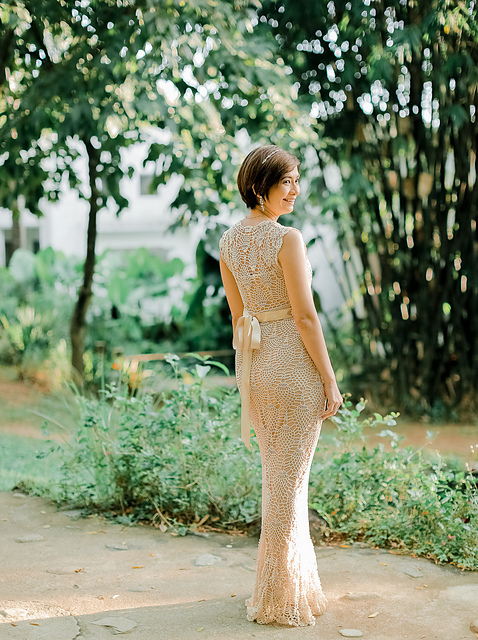 Chrysanthemum Gown by Chi Krneta 4. I guess there was some mix-up with the Best Picture Winner? I think they called the wrong movie, then realized it was a mistake halfway through their acceptance speech and made the not-winners give the award over to the actual winner. This seems so unlikely that I don’t know if I 100% believe that it happened. I could look it up and confirm. But then, what’s the point of doing a zero-research post, if I end up having to do research. 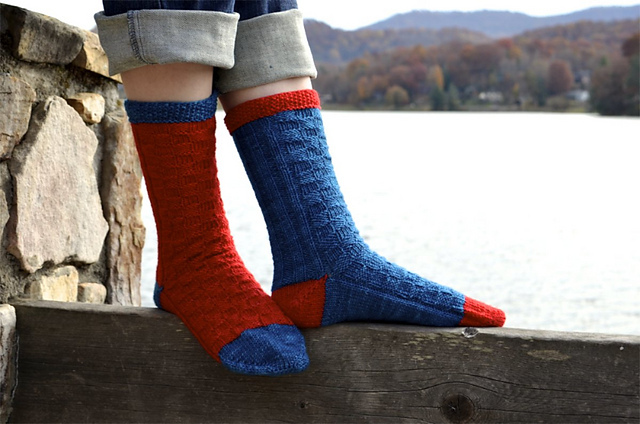 Mismatch by Jenn Morgan Did you watch the Oscars? Were they more enjoyable than I’m giving them credit for? This entry was posted in Inspiration and tagged academy awards, gown, joker, mismatched socks, mistake, Oscars, socks, trophy on February 27, 2017 by onemilljellybeans. We caught the last hour. It was fun, seeing Emma Stone win (loved her in Easy A and have watched her ever since). Jimmy Kimmel ragging on Matt Damon is always a good time! Yes, they did mix up the envelopes on best picture and that ended the show on an anticlimactic note, but Price Waterhouse has taken the blame, apologized to everyone, and life is moving on. I love STNG too (I have a cast photo with all the autographs; HUGE nerd, lol! )!